Argentina’s peso continues to struggle after its value plummeted to become one of the worst-performing currencies in the world in 2018, and the country is still facing record levels of inflation, further prompting a crisis of confidence that forced US companies to stop using the Argentinian peso to account for their business in the country, resulting in millions in foreign exchange losses. Optimism abounds among the Buenos Aires art scene, however, where the ArteBA opens on 11 April. The fair’s president Alec Oxenford says that, in the last 30 years, macro-economic volatility and high inflation “actually increase the appetite for acquiring art”. He adds that buyers sometimes see an investment in art—usually a “dollarised” asset class—as a means to protect themselves from currency fluctuations. Last week the International Monetary Fund (IMF) improved its forecast for Argentina, predicting its economy would shrink by 1.2% percent, as opposed to its previous prediction of 1.7%, but inflation levels remain much higher than this time last year when it was 14 pesos to the US dollar. The peso now hovers at around a 43-to-1 ratio as of Monday, making it the world's worst performing currency so far this year, too. With elections on the horizon in October, the Argentinian bank and government are wary of another currency crisis before the primaries. Whether this will affect buyer confidence at ArteBA remains to be seen. 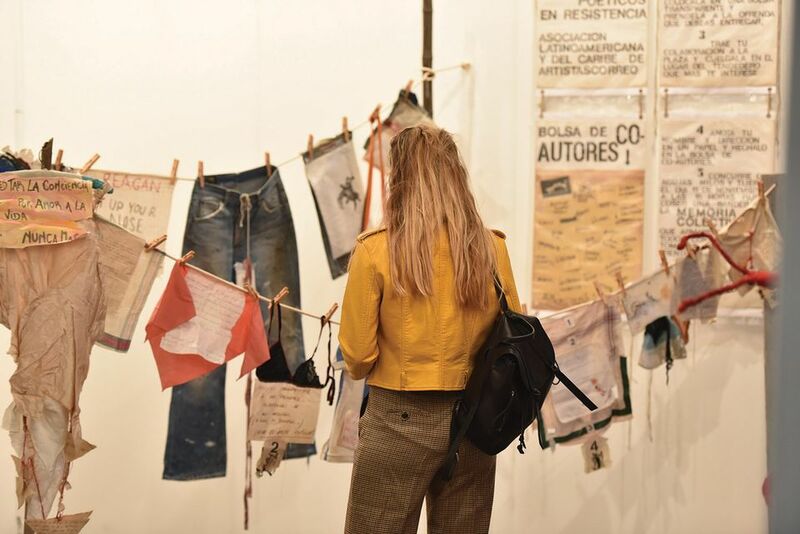 To be sure, the fair skews heavily toward regional collectors and participants: around half of its 83 exhibitors this year are from Buenos Aires, though the local dealer Nora Fisch, who has participated in ArteBA since 2010, does not see this as a limitation. “There is a sort of ‘vernacular contemporary’ [here]”, she says, explaining that a strength of the Argentinian art market is that “local artists refuse to play up to any preconceived notions of what Latin American art should be”. The launch of the ongoing Art Basel Cities Buenos Aires programming platform in September 2017 aimed to bring more international attention to the area’s artists, galleries and institutions; this year the initiative will host a series of events in April concurrent with ArteBA. The fair also launches Cardinal Site with this edition, a new section that invites six galleries from Europe, South Africa and the US as part of what its director Julia Converti calls a “long-term insertion strategy” to foster collaboration between foreign and local galleries. The ArteBA foundation also has a Matching Funds scheme intended to stoke institutional sales at the fair by museums from all around the world through acquisition funds created with help from individual patrons as well as companies. Museums such as Tate, Guggenheim, LACMA, the Broad Museum and numerous Buenos Aires-based museums have participated in it. Moreover, recent financial support provided by the government’s Investment and International Commerce Agency for Argentine galleries to participate in international fairs, and the introduction of Exporta Simple—a piece of federal regulation enacted last year by the Ministry of Production and Labour that allows shipments of up to 300kg to any country in the world without any export paperwork—have been key to growing the global collector base for Argentinian art. While these developments are helpful, Fisch notes that there is still “no end in sight” for the current domestic recession. "[While] the market suffers,” she says, “imagination does not. Our producers of culture are very resilient”.